ANTIPOLO -- UP seems to have La Salle's number this Season 81. 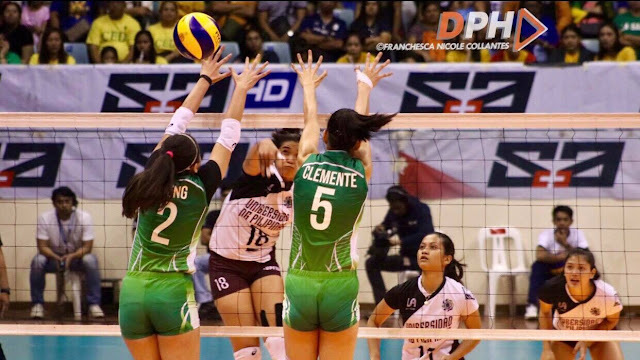 The Lady Maroons completed an elimination sweep of the Lady Spikers with a masteful 25-16, 26-24, 25-19 win to cap off UAAP women's volleyball action Sunday at the Ynares Center. Egged on by a partisan crowd, Isa Molde and Tots Carlos joined forces anew for the Katipunan spikers' fifth win in eight matches and a four-way tie for second place with La Salle, UST and FEU . Carlos fired 13 points, all on attacks, while adding eight digs and five receptions. Molde issued 11 for UP, which also took advantage of DLSU's 37 errors in the match. After taking the extended second set, UP found themselves down 16-17 in the third. But a 7-1 spurt no thanks to La Salle's rash of errors for a 23-18 advantage. A Lourdes Clemente service error and Molde's kill ended the 29-minute affair. “We still can play better. It's just a matter of time. But again it was a good game. It's our lucky day today. It's our day today." said UP coach Godfrey Okumo. Returning captain Desiree Cheng was the lone bright spot for the Lady Spikers with 11 points. DLSU suffered its first season sweep loss since Ateneo beat them twice in the eliminations of Season 79.